The Five Points in 1859. 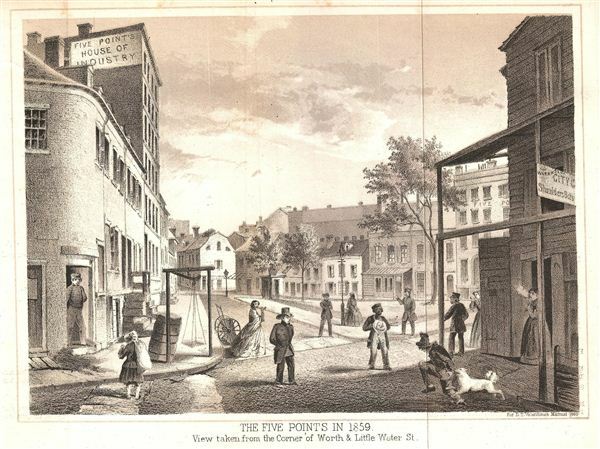 View taken from the Corner of Worth & Little Water St.
An exquisitely detailed view of New York City's Five Points slum in 1859, from the corner of Worth and Little Water St. The drawing is done from street level, and shows the Five Points House of Industry, a woman smoking, a dog biting a man's behind, and what looks to be a dandy and a policemen, among other figures. To the west of Anthony's 'fifth point' ran Little Water Street (which no longer exists) north to south, creating a triangular plot known as Paradise Square or Paradise Park, recently (re)made famous as the location of the opening gang war in Martin Scorsese's period epic The Gangs of New York. The film was based in part on Herbert Asbury's book of the same name, along with Luc Sante's Low Life, both brimming with fantastically described scenes of degradation, of a New York of only 150 years ago so violent it has no comparison in any city in the world today.